Professional System Management; Site Configuration; System Configuration; Booting OpenVMS; System-Startup Procedures; System Shutdown; License Management; Queue Management; Managing User Accounts; Disk-Space Management; Login Command Procedures; Automating System Management; OpenVMS BACKUP/RESTORE Considerations; OpenVMS Support and Documentation; OpenVMS Integrity Monitoring; OpenVMS MAIL Management; OpenVMS Security Management; OpenVMS Performance Management; OpenVMS Network Management; Installing OpenVMS Software. Appendeces: Tips for the Hobbyist; OpenVMS Site Guide; Console Summary and Hardware Characteristics; OpenVMS Privileges; Sample OpenVMS Command File Tools; Digital/Compaq/HP Manuals. OpenVMS System Management Guide, Second Edition, the most complete book on the topic, details for system administrators the tools, technologies, and techniques by which they can configure, maintain, and tune computers running Hewlett-Packard's high-performance OpenVMS operating system. 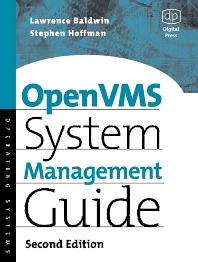 Revised by a topical authority and a principal OpenVMS engineer, the book enables system administrators to perform more efficiently and effectively those everyday tasks critical to an OpenVMS system. Examples have been updated to include OpenVMS/VAX 7.3 and OpenVMS/Alpha 7.3-1. Lawrence Baldwin is Chief Forensics Officer of myNetWatchman.com, a network analysis and internet security consultancy based in Atlanta, Georgia. He is the author of the OpenVMS System Management Guide (Digital Press, 1996). laboratory. Mr. Miller also has 20 years of aerospace experience in various software engineering positions. He is the author of OpenVMS Operating System Concepts from Digital Press, and is currently at work with Steve Hoffman on the second edition of Lawrence Baldwin’s OpenVMS System Management Guide, forthcoming from Digital Press.